The spark plugs are the business end of the ignition system. The spark plugs deliver the spark needed to ignite the air/fuel mixture. No spark means no combustion, wasted energy, increased emissions, loss of performance, idle roughness, hesitation, hard starting and possibly even a no start if all of the plugs are affected. Consider for a moment what happens when a spark plug fires. The spark is created when high voltage supplied by the ignition coil jumps across a small air gap between the plug electrodes. The high voltage surge from the coil goes down the plug center electrode, ionizes the air between the electrodes (the air gap) and forms a spark (arc) as it jumps across the gap to the outer ground electrode. The initial voltage required to form the spark may range from 4,000 up to 28,000 volts depending on the distance between the electrodes, engine load and compression (larger distances, higher engine loads and compression all raise the firing voltage requirements). The spark only lasts about a millisecond, but it is long enough to start the burn. The instant at which the spark occurs is timed precisely to coincide with the position of the piston as it approaches top dead center on its compression stroke. On most engines, the spark occurs a few degrees before the piston reaches top dead center. If the spark occurs too soon (over advanced timing), cylinder pressures rise too quickly and peak too early in the cycle resulting in a loss of power. This can also cause engine damaging "detonation" (spark knock or ping) to occur. If the spark occurs too late, cylinder pressures peak too late in the cycle also resulting in a loss of power. Timing is controlled by the engine computer and ignition module, not the spark plugs, so a timing problem would indicate a sensor or module problem. If an engine cranks but will not start, one of the first things you should check is spark. No spark at any of the plugs usually indicates an ignition problem that requires further investigation (a bad coil, ignition module, distributor pickup, crank sensor, etc.). If the engine runs but misfires, one or more spark plugs may be worn or fouled, or there may be one or more bad spark plug wires. To diagnose this kind of problem, observe the firing pattern for each cylinder on an oscilloscope. A higher than normal firing voltage in any one cylinder may indicate excessive resistance in a plug wire, a loose plug wire, or a badly worn or misgapped spark plug (too wide). A lower than normal firing voltage in any one cylinder may indicate a shorted plug wire, or a fouled or damaged spark plug. 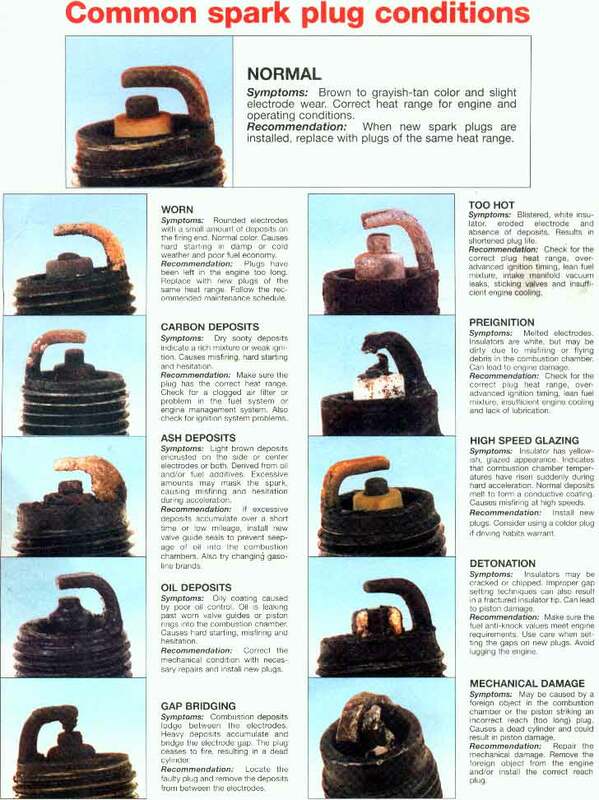 Spark Plug Fouling is the number one reason why spark plugs have to be replaced. 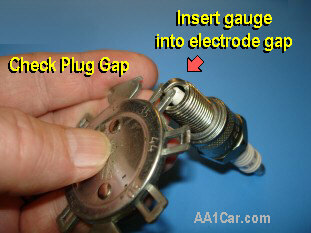 Plugs also have to be replaced for preventive maintenance because the electrodes wear as the plugs age. This increases the distance between the electrodes which in turn leads to a gradual increase in the firing voltage required to jump the gap. The gap on a standard spark plug grows about 0.00063 to 0.000126 inch for every 1,000 miles of normal driving, which means the firing voltage requirements creep up about 500 volts for every 10,000 to 15,000 miles of driving. Eventually the plugs firing voltage requirements under load exceed the ignition system output resulting in a misfire. But most plugs foul out long before they are worn out. A single fouled spark plug is bad news because it can kill up to 25% of a four cylinder engines power output. It is like riding a horse with a broken leg. A fouled plug will also cause a big increase in fuel consumption and emissions (more than enough to cause an emissions failure and/or the check engine light to come on if the vehicle has an OBD-II system). Fouling can occur if fuel or oil deposits build upon the plug electrodes. The ceramic insulator around the center electrode prevents voltage from finding a shortcut to the steel plug shell and ground. Deposits here may form a conductive path for the voltage to bleed off to ground, preventing it from jumping the gap and making a spark. Deposits around the outer ground electrode or between the electrodes may form a barrier or bridge that also prevents a spark from occurring. Fouling can be a problem if an engine uses oil. Worn valve guide seals and guides can allow oil to be sucked down the guides and into the combustion chamber. A heavy buildup of thick black deposits on the plug and intake valve would indicate such a problem. Worn or broken rings, or damage to the cylinder wall can also allow oil to enter the combustion chamber and form ash deposits on the plugs. Extensive idling and/or short trip stop and go driving can also lead to a rapid buildup of normal fuel deposits. This occurs because the plugs never get hot enough to burn off the deposits, something which plugs are designed to do. Powdery black deposits on the plugs can occur from "carbon fouling." The underlying cause here is a rich fuel mixture. On an older carbureted engine, the problem might be a broken or stuck choke. On a fuel injected engine, the problem might be a leaky injector, or a dead oxygen sensor or coolant sensor that prevents the engine control system from going into closed loop and leaning out the fuel mixture. Reading the condition of the old spark plugs can reveal a lot about what may have caused a plug to foul out as well as other problems that may be going on inside the engine, things like lean fuel mixture, rich fuel mixture, oil burning, overheating, overadvanced ignition timing, detonation/preignition and more. Replacing the spark plugs will not solve any of these problems, and the new spark plugs will likely suffer the same kind of fouling, wear or damage unless the underlying problem is diagnosed and repaired. The "heat range" of a spark plug determines how hot the plug runs during normal operation. If the heat range is correctly matched to the engine application, the plug will run hot enough under normal driving conditions to burn off fouling deposits before they can cause problems. Likewise, the plug will not get too hot and become a source of ignition causing engine-damaging preignition and detonation. If the heat range is too cool for the application, though, fouling deposits may build up faster than they are burned off. For this reason, always follow the vehicle manufacturer or plug supplier heat range recommendations when selecting a spark plug for a particular application. Two spark plugs may appear to be identical on the outside but have entirely different heat ranges. There are situations, though, that may require a slightly hotter or colder plug than the one normally recommended. Switching to a slightly hotter plug can help reduce fouling in an older engine that uses oil, for an engine that spends a lot of time idling or is used for short trip stop-and-go driving. But a hotter plug should not be used unless an engine is experiencing a fouling problem because of the increased risk of preignition and detonation. For performance applications (racing, or engines that are run under heavier than normal loads or at high rpm for sustained periods of time), switching to a slightly colder plug can minimize the risk of preignition and detonation. Even so, a colder plug can increase the risk of fouling with extended idling and low speed operation. Many of today's spark plugs have a very broad heat range because the plug manufacturer uses a copper core or platinum center electrode. Copper is an excellent conductor of heat, so the insulator can be designed to run hotter and burn off fouling deposits without it getting too hot under increased load to cause preignition or detonation. A solid platinum center electrode will also carry heat away from the tip, but not if the electrode only has a platinum tip. The recommended replacement interval for standard spark plugs has typically been every 30,000 to 45,000 miles. But most of extended life plugs have special wear-resistant electrodes made of platinum, iridium, nickel yttrium or other exotic alloys that minimize electrode erosion. Such plugs can usually go 100,000 miles plus with little or no electrode wear, and next generation spark plugs with ruthenium alloy electrodes can last up to 2X longer than iridium plugs. Even so, they may still be vulnerable to fouling if an engine has an oil consumption problem or spends excessive amounts of time idling. Extended life spark plugs are a good upgrade for many engines, but may not be the best choice for an older engine that uses oil or even some performance engines. According to one plug manufacturer, platinum tipped electrodes run hotter than standard electrodes. This may increase the risk of preignition and detonation in some turbocharged and high performance engines. For such applications, a standard plug with a colder heat range, or iridium or ruthenium electrodes might be a safer choice. There are also a wide variety of electrode configurations from which to choose today. Each manufacturer claims certain performance benefits for their particular design. It may be reduced electrode wear, or improved ignition reliability, or both. Small diameter fine wire iridium plugs, for example, concentrate the spark for easier ignitability and better flame propagation. Such plugs are often marketed as "premium" or "performance" plugs, and may command a price of up to $6 or $7 apiece. Some long life spark plugs (as well as standard plugs) also have multiple electrodes (two, three or four ground electrodes). A spark plugs with more than one ground electrode will still only produce one spark per ignition cycle. But with four paths from which to choose, the likelihood of getting a good spark to at least one of the ground electrodes is multiplied for improved ignition reliability. Having more than one ground electrode also distributes the wear to minimize electrode erosion and growth of the spark gap over time. Some such plugs also experience a self-cleaning effect because the sideways path of the spark helps burn deposits off of the insulator. Are premium plugs worth the extra money? They are if they can provide extended plug life, reduce the need for maintenance or improve overall ignition performance. The plugs in many front-wheel drive cars and minivans with V6 engines are very difficult to replace. Installing extended life plugs can almost eliminate the plug change hassle for good. Likewise, performance plugs that reduce misfires can enhance performance for a smoother running, cleaner more fuel efficient engine. No spark plug can create power out of thin air, but improved ignition reliability can minimize any horsepower loss due to misfire. When changing spark plugs, wait until the engine has cooled to remove the plugs. The engine should be at or near room temperature, and not hot to the touch. This is very important with aluminum cylinder heads because it reduces the risk of damaging the threads in the cylinder heads when the plugs come out (aluminum is a much softer metal than cast iron). Most threads on spark plugs for engines with aluminum heads are either precoated to reduce the risk of thread damage, or the plug shell is made of a nickel alloy. If the plug shell is black or plain steel, however, you should put some antiseize to the threads, and reduce the applied torque by about 30 to 40%. Do not use antiseize if the plug shell is nickel or has been precoated. Antiseize acts like a lubricant and may allow too much torque to be applied to the plugs, damaging the treads in the cylinder head. Watch Out for Ford Motorcraft Two-piece Spark Plugs That Break! The original equipment Motorcraft brand spark plugs that were factory installed in many late model (2004 to 2008) Ford trucks with 5.4L V8 and 6.8L V10 engines, 2005 to 2007 Mustang GT 4.6 & 5.4L V8 engines, and 2008 Mustang GT models built prior to 11/30/07) can break when you attempt to remove them! The spark plugs have a crimped lower electrode shell that becomes coated with carbon, causing it to stick in the cylinder head. When you attempt to unscrew the plug, the lower shell breaks off and stays in the head. Removing the broken shell requires a special Ford, Snap-On or Lisle extractor tool. Worse yet, if any shell or electrode fragments fall into the cylinder and can't be fished out, you may have to remove the cylinder head to get the debris out. Many experts recommend replacing the original equipment Motorcraft spark plugs before the get too many miles on them (over 35,000). Replacing the plugs at low mileage will reduce the risk of them sticking and breaking. Waiting until the original equipment spark plugs have 100,000 miles on them is asking for trouble! Ford Technical Service Bulletin 08-7-6 covers the recommended removal procedure for these spark plugs, as well as the repair procedure if one or more plugs break ( Click Here to View Ford TSB 08-7-6). Essentially, it says to remove the spark plugs when the engine is COLD (room temperature). Loosen the plugs about 1/8 to 1/4 turn, stop and spray some WD-40 or penetrating oil into the spark plug well. Allow the oil to soak into the threads so it can loosen the carbon around the electrode shell. Wait at least 15 minutes, or longer (overnight is recommended if the plugs have over 80,000 miles on them). Then slowly loosen the plugs, applying no more than 35 ft. lbs of torque to your wrench. If a plug sticks, retighten it half a turn, apply more penetrating oil, wait, then try again. 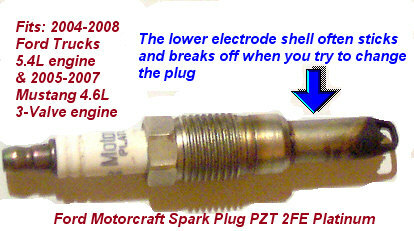 Do NOT reinstall the same Motorcraft spark plugs (PZT 2FE Platinum). Replace them with a much improved one-piece spark plug from Champion (7989), or a similar spark plug from NGK, Denso or Bosch. Apply nickel anti-seize to the outer surface of the lower electrode shell (the smooth part) before installing the plugs. For more information about the Ford spark plug breakage problem Click Here. TIGHTENING SPARK PLUGS: BE CAREFUL! How much the spark plugs should be tightened depends on the size of the plugs and the type of plug seat. Spark plugs with gasket style seats require more torque than those with taper seats. Always follow the vehicle manufacturer torque recommendations, but as a general rule 14 mm plugs with a gasket style seat should be tightened to 26 to 30 ft.lbs. in cast iron heads, but only 18 to 22 ft.lbs. in aluminum heads. Likewise, 18 mm plugs with gasket style seats should be tightened to 32 to 38 ft.lbs. in cast iron heads but only 28 to 34 ft.lbs. in aluminum heads. For taper seat spark plugs, 14 mm plugs should be tightened to 7 to 15 ft.lbs. in both cast iron and aluminum, while 18 mm taper seat plugs should be tightened to 15 to 20 ft.lbs. in both types of heads. As for setting the plug gap, always follow the vehicle manufacturer recommendations. Spark plug gaps typically range from .028 inches up to .034 inches or even larger. One exception here is Bosch Platinum+4 or Platinum+2 spark plugs. These plugs are pregapped at the factory to a standard 1.6 mm gap and should NOT be altered regardless of what the vehicle manufacturer specifies for the engine. Bosch says this is necessary to achieve maximum plug performance and longevity, so do not change the gap. 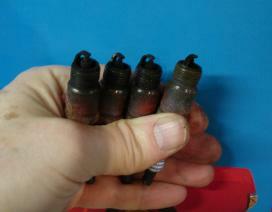 Finally, play close attention to the condition of the spark plug cables and boots when changing the plugs. Loose fitting boots or damaged cables can cause ignition misfire. If your engine has a coil-on-plug ignition system, replacing the rubber boot that fits between the coil and spark plug is recommended when changing high mileage spark plugs. This will prevent arcing that can cause misfires. On engines with a distributor or a DIS coil pack, make sure the spark plug wires are properly routed to the correct cylinders (look up the firing order if it is not marked on the cabled). Plug wires must also be supported in their looms to avoid crossfire problems and contact with the hot exhaust manifold. Original Equipment Spark Plugs, Are They Best?